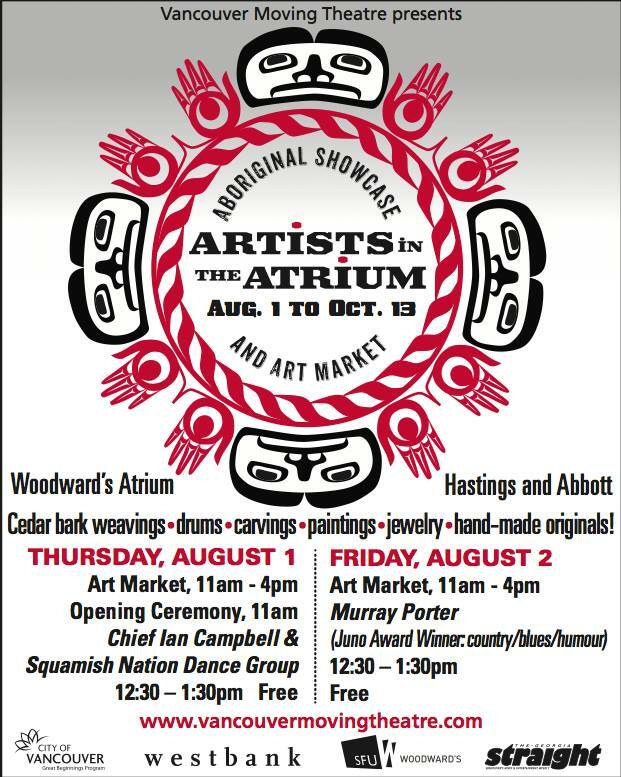 Artists in the Atrium (AITA) takes place from August to October 2013 at the Woodward’s Atrium at Hastings and Abbott. AITA will promote and support the arts and culture of the Downtown Eastside through performance showcases, an art market and a series of workshops. Opening Ceremonies were at 11am, Aug 1 at the Woodwards Atrium. Elder, Margaret George, Tsleil-Waututh First Nation, Elder, Larry Grant, Musqueam Nation and Chief Ian Campbell, Squamish Nation will open the event followed by Chief Ian Campbell and the Squamish Nation Dance Group at 12:30pm.